We do more than give advice. We build a close, committed relationship with you. You may be surprised at the lengths we go to understand your situation. It’s the only way we know how to help. By going all in and researching the fine details, we allow you to make informed choices between clearly-defined options. Our approach to financial planning centers on learning who you are: your background, your past successes and failures, your future hopes and dreams. We start by looking at where you are today, including a meticulous assessment of your current financial situation. This includes your assets — such as investment accounts and real estate — and liabilities — such as mortgages, car loans, credit cards and more. Next we break down how much you earn and how much you spend. Helping you budget is a house specialty. We evaluate your insurance to identify gaps or areas where you might be over-insured. We analyze your tax situation to see how we can save you money. Finally, we talk about your legacy, and what you want to happen with your assets when you’re gone. Now we turn our attention to helping you meet your future goals. How much can you save during your working years? What major expenses do you need to plan for, like college for your kids or buying a house? To strategize your retirement, we project your income and expenses. And we work with your estate attorney (we can recommend a great one if you don’t have one already) to help plan your legacy. Once we’ve completed your custom financial plan, we put it on a timeline and help you implement it. We monitor your progress regularly, making adjustments whenever necessary. Although we take the lead, the process of moving you steadfastly toward your life goals is a close collaboration. foundation of personal info.) 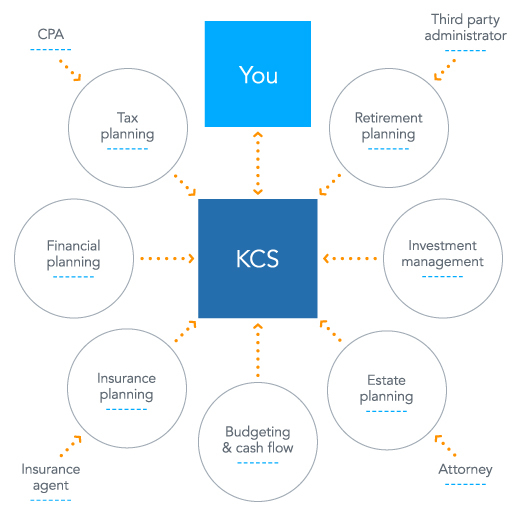 We get to know your family, your professional profile, your retirement plans and much more. 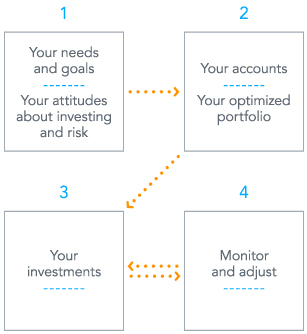 We dig into your views about investing, too, including how you feel about risk. Based on all this analysis, we calculate your target rate of return. Then we recommend the lowest risk investment portfolio that can get you to your goals. Second, we recommend the types of accounts your portfolio should include. The specific mix is dictated by your needs. We choose from a range of taxable investment accounts, as well as non-taxable or tax-deferred accounts like IRA’s and Roth IRA’s, 401k’s, defined benefit plans, annuities and 529’s. Third, we invest your funds across a broad range of asset types. These include—but are not limited to—cash and cash equivalents, US and foreign stocks, bonds and other fixed-income securities, exchange-traded funds (ETF’s), real estate and other alternative investments. Fourth, we monitor your portfolio regularly, adjusting the asset allocations and individual securities in response to changes in your needs or market conditions. You’re welcome to check the status of your portfolio as frequently or infrequently as you like. We take a long-term view of investing, and encourage you to do the same. We’re always available to answer questions about your portfolio or the economy in general — whatever helps you meet your goals and sleep soundly at night. The best financial plans and investment strategies are thoroughly researched and thoughtfully conceived. Equally important, they’re carefully executed. We keep a watchful eye on all facets of your financial life, so you can focus your energies elsewhere. We also function as your sounding board for all kinds of financial decisions, large and small — for no extra fee. Deciding whether to use loans or cash to fund college or graduate school? Weighing the benefits of buying vs. leasing a home or car? Need help managing debt? Just pick up the phone or send us an email. A major way we add value is by serving as the hub of a network of trusted professionals whose expertise complements our own. We quarterback all your financial professionals, so you don’t have to. If you’re missing a key player on your team — such as an excellent CPA, insurance specialist, estate attorney, mortgage broker or real estate agent — we can recommend one. Business owners gets a double dose of responsibility. You manage the core business and, often, you run the company’s finances, too. We can help you streamline these financial functions and lighten your load. As a business owner, chances are your personal and business finances are intricately interwoven. We’ll help you align your personal financial goals with your business planning; manage your assets and cash flows; and coordinate with your legal, tax and estate professionals to make sure your business works as hard for you as you do for it. If your company has a retirement plan, we’ll help you maximize its benefit for you and your employees. 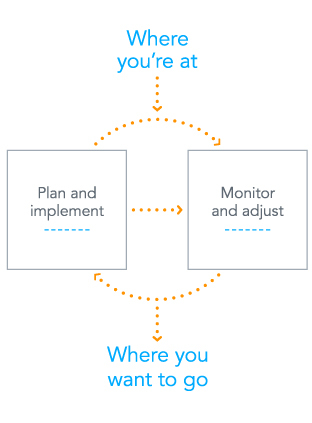 We’ll collaborate with third-party administrators to design the best plan for your business, then educate you and your employees about how to get the most from the plan’s features. We’ll help your employees prepare for retirement, and minimize their taxes along the way.